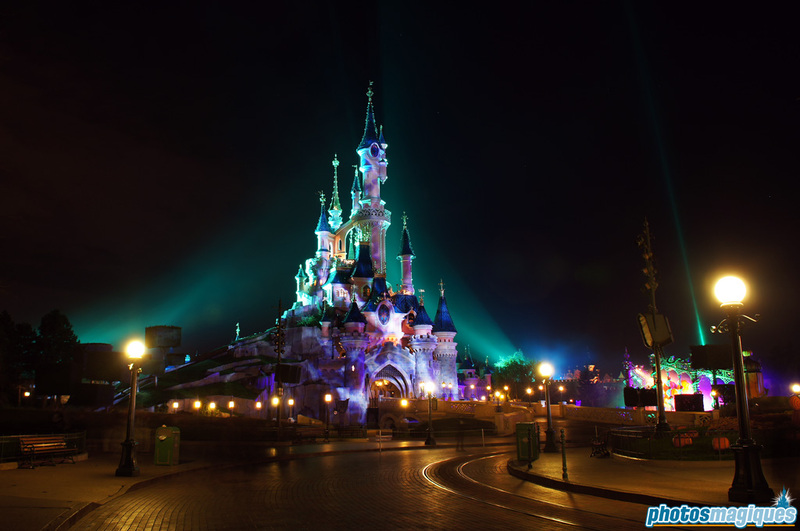 Sleeping Beauty Castle, or Le Château de la Belle au Bois Dormant, is lit up for the Disney’s Halloween Party on 31 October. By using a long exposure, a washed-out look is created because of the moving cloud projections on the Castle walls. On top of that, the green lights from the sides add to even more spookiness. Happy Halloween: updated with new photos! What better way to celebrate Halloween is there then taking a look at this year’s Halloween Festival! In this album we’ll take a look at the amazing new decorations that are now placed around Main Street, U.S.A., Central Plaza and Frontierland. See more. This show was first introduced during last year’s Halloween Festival. It made a warm welcome back this year. See more. Click here if you dare! This no-kids-under-12 party at Walt Disney Studios Park will scare the zombies out of you. See more. The classic family-friendly hard-ticket on 31 October with special entertainment, shows and the final performance of Disney’s Fantillusion. See more. What would Halloween be without Disney Characters? The Halloween Season usually has lots of rare characters come out in the park, whether it’s a Disney Villain or a classic character in special Halloween outfits. Over the past few Halloween seasons, there has been quite a selection of Halloween merchandise released. We’ve compiled a selection of merchandise from over the years in this slideshow. Tip: click the first thumbnail and keep clicking the enlarged image to go forward. Captions are provided below each image. The Phantom Cruise Line was a huge ghostly sculpture that appeared to pull the Mark Twain Riverboat during the Halloween Season of 2003 and 2004. It didn’t return for the 2005 season after several technical issues and even a derailment. Did you ever have the chance to see the Phantom Cruise Line cross the Rivers of the Far West? In 2005 the Halloween season was expanded with more Disneyland Paris-unique characters, called the Pink Witches. The story behind it was that Pink Witches arrived in Disneyland Park and set up a convention meeting in Halloweenland, called the Pink Witch Academy. Their sole purpose was to battle the Pumpkin Men and made the guests choose sides. With the arrival of these new decorations, many Disney fans world wide were shocked by the cheap designs and build. On top of that, a collection of Pink Witches representing European countries were considered by many fans and guests as an insult.